PRODUCT: RD-27 FLAT GRATE Parapet / Scupper Drain. 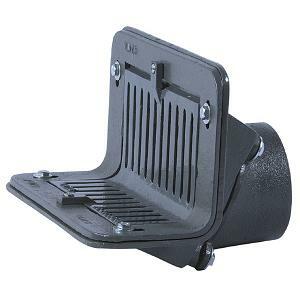 Epoxy coated cast iron scupper drain with flashing clamp, removable FLAT face (L-shaped) grate, 45 or 90 degree rotatable no-hub (standard) outlet. Price/Each. DESCRIPTION: A well constructed, heavy duty, versatile roof drain combining horizontal and vertical drainage with an interchangeable hub for flexible installation. Designed for sidewall installation. No-Hub connection type. OPTIONS: 2, 3 or 4" outlets, FLAT or ANGLED grates, Nickel Bronze Grate. Uses matching sized EPDM Connector, not included. RD-27 Scupper Drain Replacement Flashing Clamp. Outer Clamp Ring, Gray Epoxy Coated Cast Iron. Price/Each.